Palmer Station in 1965. BUCN Chuck Alletto poses in front of the newly constructed station he helped build. 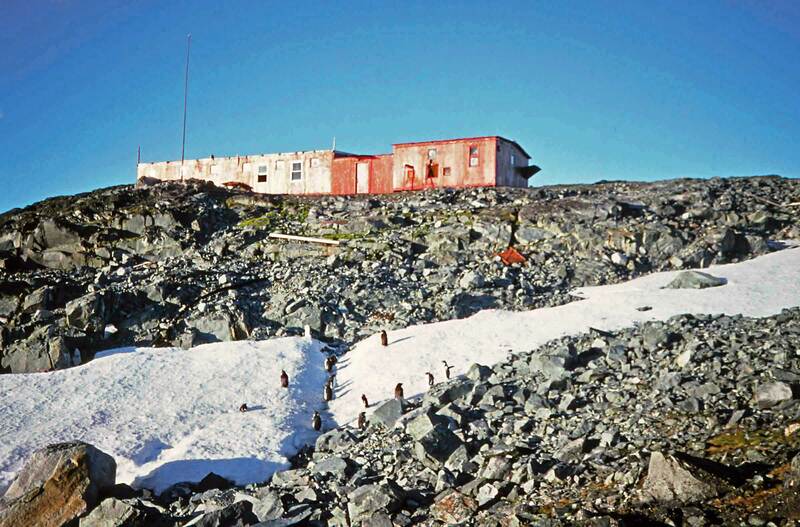 The United States had its second significant Antarctic station (after Little America) in the Antarctic Peninsula area, on Stonington Island during the US Antarctic Service Expedition (1939-41). The site, known as East Base, is located about 250 miles south of the current Palmer Station site. It was also occupied by Finn Ronne's expedition of 1947-48. The US did not occupy a station on the Peninsula during the International Geophysical Year (1957-58), but the post-IGY expansion of the US program created renewed interest in the Peninsula. The first survey team visited the region in January and February of 1963. After examining about 30 potential sites, the Arthur Harbor area of Anvers Island emerged as the most promising because it was centrally located and was near the southern limit of favorable summer sea-ice conditions. In January 1964, a second survey team was landed at Anvers Island by the USCGS Eastwind to select the specific location for the new station. They set up a Jamesway on Bonaparte Point to look for suitable locations before departing for PA on 27 January. 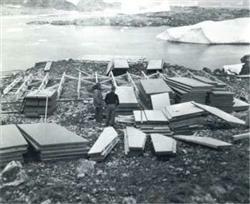 The original "Old Palmer" (OP) site on Norsel Point was selected because it was in proximity to the FIDS/British Antarctic Survey's "Base N," and because the British allowed use of the base facilities while new buildings were constructed. 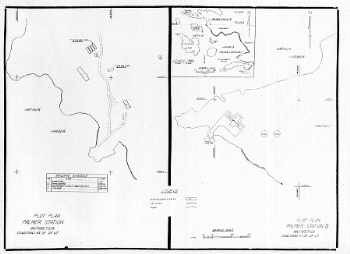 The main building of the first station was a 82'x30' complex of T-5 (also referred to as N-2) structures on a bluff north of Arthur Harbor (see the photos below, this was the same type of prefab construction originally used at McM and Old Pole). 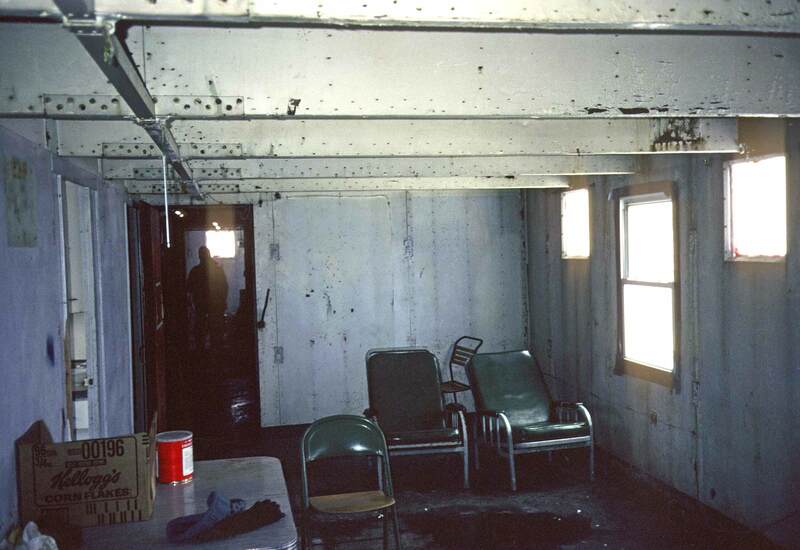 This was intended as an interim facility while the permanent station was designed and built. The construction materials and crew (an 11-man Seabee detachment from NMCB-6) arrived on the USS Edisto on 12 January 1965, started construction on the 16th, and work was completed two weeks ahead of schedule on 24 February. 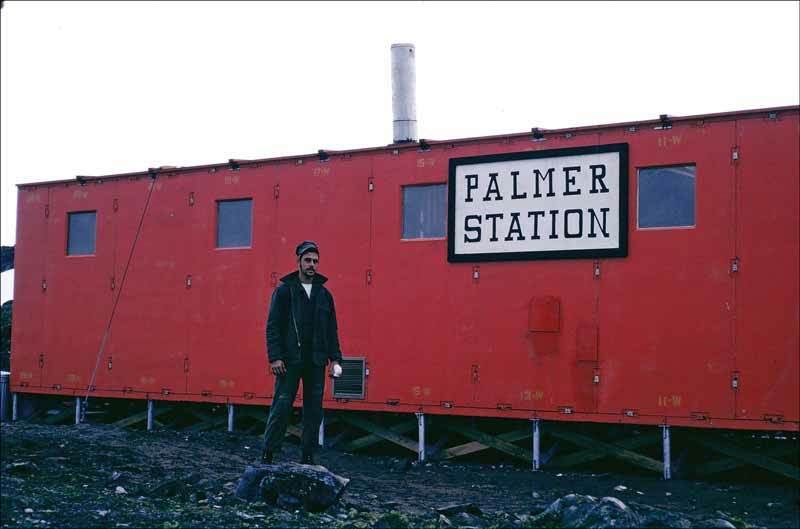 This was formally established as "Palmer Station" in a brief ceremony on 25 February. The new building could accommodate as many as 15 persons (?). At left is a "before" picture of the station construction--the first of my series of construction pictures. Click here for the rest of the photos. Base N had been occupied by the British for 3 winters, 1955-57. The BAS main effort had not been marine biology, but geology (with a good bit of mountaineering on the side, after all that is where the rocks are. They did the first ascent of Mt. Francais). Among other things they thought there was a good source of copper ore nearby! After Base N was officially closed, it was still occupied sporadically during the summers in support of BAS air operations on the glacier. While OP was occupied by USARP, the British building was used as a lab for biological and glaciological studies. The Base N building burned in 1971 when BAS was doing maintenance and a blowtorch ignited the attic. There was little sign of it in 1987 when I first visited the site without snow cover. At right are the Navy site and location plans for Old Palmer as well as the current station. This drawing is for the 1966-67 season, careful observers will note that Arthur Harbor is considerably larger nowadays. Also check out Marc Pomeroy's map which is a bit more current and more detailed. The first Palmer Station winterover crew was 5 USARPs (3 glaciologists/met types and 2 biologists) and 4 NSFA Navy men. They did lots of traveling, 30 miles or more inland. During the initial station construction the first 8 miles of the trail was explored to a glaciology camp where a Jamesway was erected (it was quickly buried during the first winter). Based on further surveys the US determined that the site of the current Palmer Station on Gamage Point would more suitable for a permanent station because it was more accessible by sea. Construction started on the Biolab in January 1967 and it was finished the following summer. R/V Hero showed up on Christmas Day 1968, and GWR was finished during the 69-70 summer. Old Palmer remained as an emergency refuge until the early 1990's when it was removed and the site cleaned up in accordance with the current environmental guidelines. I took the three photos below in about 1989; at that time the building roof and weatherproofing had been repaired, and several newer vinyl double-hung windows had been installed. The front side of Old Palmer as it is being visited by penguins. The back side of the station. Inside the main living room. Berthing was down that hallway. Other information about the station...behind me (as I took the above photo) was a passageway to a separate structure which housed three generators, fed from a 50,000 gallon fuel supply consisting of bladders behind the station. Water was produced using a snow melter--a hopper on the southeast side of the station which can be seen in the photos...at the bottom of the hopper was a tank heated with a waste heat coil from the generators. The snow melter was filled with the front-end loader. Additionally, during the late summer and fall, water was collected from a glacier stream outside of the old British hut...these were good times as there was plenty of water...when the melter had to be used, water usage had to be drastically reduced. Also in the room with the generators was the "facility," which consisted of a toilet seat above half of a 55-gallon drum with handles welded on. When the honey bucket got filled, two folks would remove it through a hatch in the exterior wall and carry it down to the shore where it was placed on the ice. 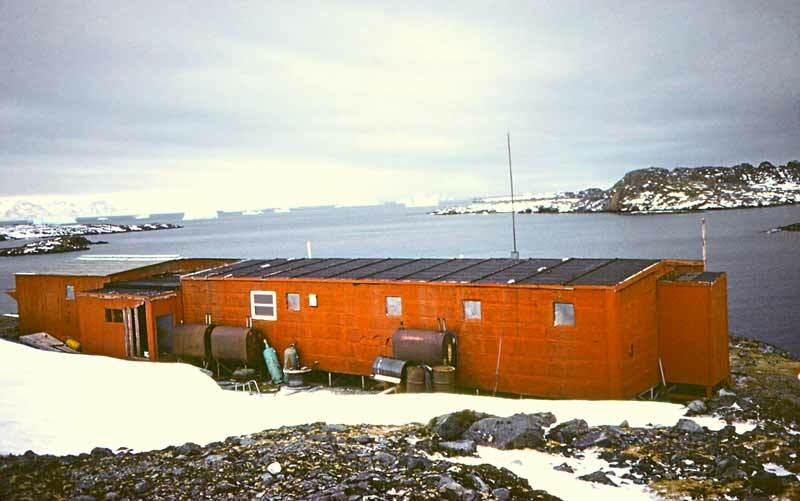 Guthridge, Guy G. "Palmer, an Antarctic Peninsula research station"
Antarctic Journal of the United States, National Science Foundation, Vol. XVI No. 4, December 1981, pp 1-9. "Hero: A New Antarctic Research Ship"
Antarctic Journal of the United States, National Science Foundation, Vol. III No. 3, May/June 1968, pp 53-60. History and Research Division, U. S. Naval Support Force, Antarctica. Fourth Edition, February 1968 (the source of the photo at the top of this page, and the maps). And last but not least, there's the amazingly extensive blog by chief radioman Jack Cummings. Start here for the beginning of a great saga!